Now that’s a winning ticket! Actually it’s just creepy. 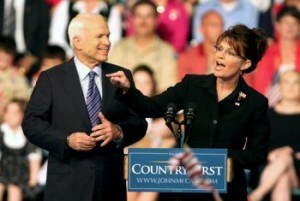 I didn’t think the Repugnicans would give up that easy, they must be setting something up for 2012. $10 says she withdraws before the election. I’ll take that bet. You still owe me from your prediction that John “Winter Soldier” Kerry would be the next President. Your predictions haven’t been accurate for almost a decade. Nice call. BTW — Obama in a landslide. Finally, people like you can go back to being irrelevant and America can get back to being great again. What you’re going to find is YOU’RE going to be just as irrelevant as I am.